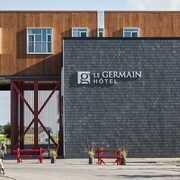 Where to find Les Eboulements hotels near an airport? Where can I find hotels in Les Eboulements that are near tourist attractions? 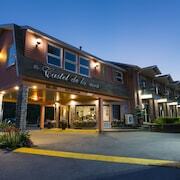 Looking to find accommodation options in Charlevoix, specifically in or near Les Eboulements? About 8 hotels and apartments can be found within a 0.1-kilometre (0.06-mile) radius of the center of Les Eboulements. If you are after a hotel that is only a stroll from the Les Eboulements city center, Auberge de Nos Aïeux and L'Authentique Auberge de Charlevoix will be perfect. You could also check out the Fairmont Le Manoir Richelieu as well as the Hotel Pavillons Le Petit Manoir du Casino. The Fairmont Le Manoir Richelieu is positioned 20 kilometres (13 miles) from the middle of Les Eboulements. The Hotel Pavillons Le Petit Manoir du Casino, is positioned 20 kilometres (13 miles) away. 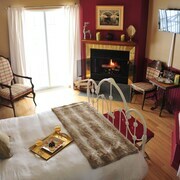 Alternatively, check out the amenities and rates at the Auberge Fleurs de Lune or the Hôtel Au Petit Berger. 85 kilometres (54 miles) away from Les Eboulements you'll find Tadoussac, where you can explore Tadoussac Marina and Saguenay–St. Lawrence Marine Park. 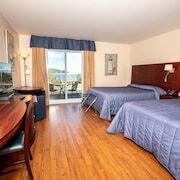 The Hôtel Tadoussac and Motel le Vacancier are just some of the great long and short-stay options in Tadoussac. 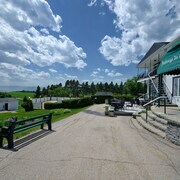 5 kilometres (3 miles) to the west of Les Eboulements, you'll also find Saint-Joseph-de-la-Rive, home to the Auberge La Maison sous les Pins and Hotel La Roche Pleureuse. 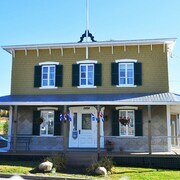 The St-Joseph-de-la-Rive Ferry Terminal and Charlevoix Maritime Museum are popular sites to explore for those visiting Saint-Joseph-de-la-Rive. Before you head home from Charlevoix, make sure you experience some local sport. Visit Agora Port de Quebec to the southwest of Les Eboulements. Book accommodation near the action at the Auberge Saint-Antoine by Relais & Châteaux or the Fairmont Le Chateau Frontenac. Our travel guide is a good way to discover more about Les Eboulements. What are the most popular Les Eboulements hotels? Are there hotels in other cities near Les Eboulements? What other types of accommodations are available in Les Eboulements? Explore Les Eboulements with Expedia.ca’s Travel Guides to find the best flights, cars, holiday packages and more!